Sound post-production work will generally be done in parallel with editing the image (most programs allow sound and image to be edited together). Offline and online editing does include sound editing but there are various processes that will require specialist equipment or programs. Most of these companies, similar to Online Editing, will work on the final processes of sound editing to prepare your soundtrack for the production of the master copy. Once the picture edit is finalised (and ready for mastering) work can begin on the final sound edit which can be broken down into track laying and final sound mix. In track laying the sound material will be cleaned and divided into its separate sound tracks. These tracks, described below, will be individually edited and processed. If required, dialogue will be re-recorded in a process called Automated Dialogue Replacement (ADR) and foley work and sound effects will be added. The separate tracks will be matched to the image edit before being prepared for the final mix (DUB) is performed. All of this stage can be done on desktop equipment with the right audio set-up at home or with a small company. Actors voices recorded on set. Mono and stereo sound effects. Continuous sound that flows throughout work. Recreation of various incidental sounds (footsteps, door slams) performed by foley artists. Background and foreground music (licensed and original). The final sound mix is the most important stage as this is where all the separate tracks are balanced and mixed into one final soundtrack. It is essential to get this right or one track could obscure another. If you are making a film print this track will be put on a DAT tape for the lab to process into the film's optical track. For video masters the mix will be put through a compression / limit box so it can be printed to tape. If you are making a print or will show your work in a cinema it is important to try to get time in a film dubbing theatre (a cinema with mixing desk) so you can check the soundtrack properly. 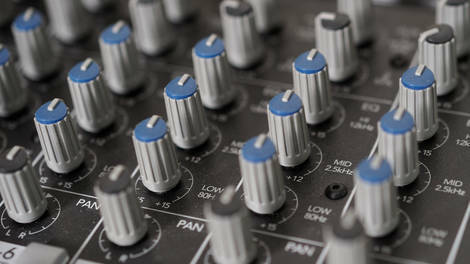 There are a number of mixing formats you can choose from when finishing your soundtrack some of which need to be licensed from their manufacturer. Simple left and right stereo. Simple left and right stereo used for video and DVD. Can be used with Dolby cinema equipment, but not recommended. Digital format which encodes left, right, centre, left surround, right surround and sub woofer channels into a single file. Simple left and right stereo format similar to standard Dolby. Digital format but not as widely used. Expensive high quality digital format for 35mm prints available in 6 or 8 channels.